Unfortunately, Acteeva Day Camps is not available this summer. about our other all-outdoors programs. Come join Acteeva and experience the outdoors, fun and friendships in a whole new way! Acteeva Day Camp contains the quality and expertise that has distinguished Roughing It Day Camp and the Roughing It Family of Camps since 1972. 1-week outdoor camp experience in the familiar surroundings of our school site. Skill-based learning is incorporated into each of our four main program areas: sports, outdoor & camping skills, arts and crafts, and nature. Choose from 25 activities offered each day. 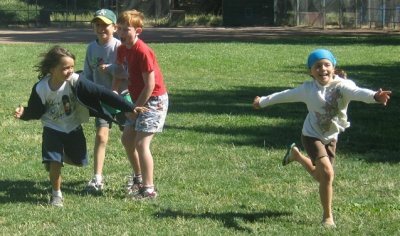 By selecting their activities for themselves, Acteeva gives campers the opportunity to shape their own camp experience. Campers make lots of new friends, and our caring adult staff help and everyone succeed. Acteeva's unique structure allows campers to feel safe while trying new challenges. "My kids couldn't wait to go back to camp each day!"